Karastan Carpet is proud of their past—the rugs and carpets they have designed and the processes they have invented. Karastan Carpet has always taken flooring in bold new directions. Karastan Carpet’s history is in the making. They are always moving ahead with new ideas, new colors, new fibers, and new techniques to make your home a beautiful—and more personal—place in which to live. With Karastan carpet, it's impossible to go wrong. But even so, certain styles of carpeting do offer a better fit for certain types of consumers and areas, so here are a few things to give special attention as you are shopping and make your selection. The first thing, of course, is the look. 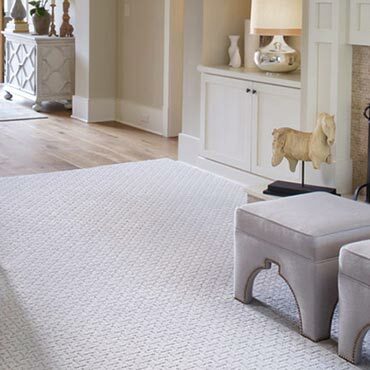 Some people think of patterned carpets as being the ultimate symbols of elegance; berbers and other loop piles as ideal for family or high-traffic areas; and, quite often, plush or textured carpets as offering the best of both worlds. With Karastan Carpet, choosing the right look is an entirely personal decision, but here are a few points that might affect your final selection. For all intents and purposes there are four types of carpet styles: berbers, plushes, patterns and textures. Within each carpet style is even greater choice. For example, one can find dense or loose piles; high or low pile heights, tight or loose densities and so on. This wide range of choice is offered to accommodate different looks, prices, and qualities. It may all look similar when one first begins the shopping experience, but there really are many different styles to consider. The one single thing to always keep in mind is quality. Because Karastan only used premium materials, every Karastan carpet will offer superior resistance to staining, matting, and wear. Check for yourself when you're in the store and have a chance to make side-by-side comparisons. First, check the density, which you'll feel by running your hand over the carpet, and which you can easily see by bending carpet samples and comparing how much yarn is used in the construction of each product. The higher the fiber density, the higher the quality, the better resistance to wear and matting. Second, check the type of material the carpet is constructed from. You should find it named on the back label of each sample. Many of Karastan’s top-of-the-line carpets feature 100% pure New Zealand wool, the finest quality wool in the world. It offers the best combination of luxurious look and feel, along with practical durability. And while Karastan wool carpets are the finest made, there's absolutely nothing wrong with choosing a carpet made of man-made materials like nylon, though you should opt for the highest-quality nylon you can afford. Quality nylon carpets offer good resistance to wear, matting and fading, and some of the highest-quality versions approach wool in its luxuriousness. Ask a knowledgeable carpet consultant or salesperson to direct you to the best material for your budget. Third, check for any special detailing such as stain- or matting-resistance warranties on the label and high density backing which can provide superior stability. It's well worth your time to investigate all carpet features by talking both to salespeople and consultants, and to friends and family who've had good success with their selections. Finally, don't make the mistake of thinking you can compare the real cost of different carpets by the price per square foot. There are many factors that contribute to the affordability of carpet such as the quality of the carpet, pad and installation service that you have chosen. There are real differences, and you have real choices. High-quality carpets like Karastan may appear to cost more initially, but in many cases, will stand up strong to years of daily wear whereas others may show wear much sooner. "The Karastan brand represents much more than flooring! Beginning at 2:02 pm on April 28, 1998, we walk you through the rich history of quality craftsmanship and innovation that is Karastan. Learn why Karastan rugs were referred to as "the Wonder Rugs of North America," the role Karastan played in bringing comfort to the average American household with rugs and wall-to-wall carpeting, and the continued leading role Karastan plays in home design."